Useful & Convenient – The Kick Mats That Will Keep The Back Of Your Car Seats As Good As New Forever! Planning on going a trip and can’t stop worrying about the mess your kids are going to make in the back seats? You need something that will protect your beautiful and shiny car and will keep it clean from any stains. That’s why we invented these back seat covers so that you can enjoy your ride without any troubles! * Our mats are designed for any car model available on the market and will work wonders for your car, too! * Thanks to its waterproof construction, this product can protect your seat from dirt and mud, saving you from the chore of cleaning them afterwards! * Includes adjustable buckle attachments that secure the seat from the headrest to the bottom! * It is made of the highest quality fabric that will never allow for moisture to reach and destroy your seats. Why waste your time cleaning your car all the time when you can just invest once on something that will save you tons of time and money! Act smart and don’t let mud and dirt get into your way. GREAT QUALITY- In order to provide products of supreme traits, we had to focus on quality. And that is what we did! One of the best fabrics available on the market has been used for the production of our deluxe kick mats. Perfect for anyone that takes good care of his car. 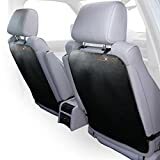 Specially made to protect your back seats from any stains, dirt and mud! VAST COVERAGE- Different types of cars require diverse kinds of equipment. Not anymore, because this mat can provide full coverage every car seat as it consists of adjustable buckle attachments. From the headrest to the bottom you can be sure no foulness will infiltrate your seat! STYLE & FUNCTION-Maintain the beauty of your interior and provide full protection with our classy, black mats that will blend perfectly with your seats! Just to make your decision easier, think that the cost doesn’t even measure to all the time and money you will save from a professional cleaning that a dirty seat may require! EASY TO CLEAN- After a long trip with your entire family, coming home seems like a nightmare, when you think about cleaning the car. With these Kick Mats cleaning is a piece of cake. You either spray them with your hose in the backyard or put them in the washing machine and they will be ready for another trip in a few hours. EXTRA STRONG- Thanks to its remarkable construction, these mats can support high pressure with no danger of ripping. Therefore, you can rely on our superb product to keep your car safe and clean for a long time!